With a starting MSRP of $84,765, the 2019 Toyota Land Cruiser is the most expensive vehicle in the Toyota lineup. Perfect for drivers who want access to the Toyota suite of performance equipment, tech features, active safety, and amenities at their fingertips, the 2019 Land Cruiser has everything needed for life on the go, no matter where their travels end up taking them. With a standard 5.7L V8 engine rated at 381 horsepower and 401 pound-feet of torque paired to an eight-speed automatic transmission, the 2019 Land Cruiser offers plenty of oomph to power you along, even when the eight-passenger cabin is packed. An independent double-wishbone suspension system keeps everything smooth and level, even when the roads ahead get bumpy. Learn more about the 2019 Toyota Land Cruiser lineup below, then schedule a test drive at Serra Toyota in Birmingham, AL. With only one high-end trim level, the 2019 Toyota Land Cruiser lineup is easy to shop and comes fully loaded with everything drivers need on smooth pavement and rocky terrain. While the lineup is more specialized for off-roading, it can also pull double duty as a people mover and offers an optional rear-seat entertainment system to drivers who would like to add on some amenities for rear-seat passengers. 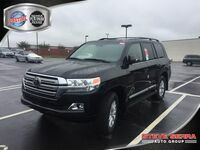 Look for the current 2019 Toyota Land Cruiser lineup at Serra Toyota in Birmingham. If you don’t see a new Land Cruiser in our inventory, give us a call and let us know you are interested in the lineup. We can help source you your preferred configuration. If you do see a Land Cruiser available, sign up for a test drive to get behind the wheel for additional hands-on research. Interested in a 2019 Toyota Land Cruiser?